Test day for On-Piste Cruisers last February was a fast one. If you love carving, edge hold and energy, keep reading. This is a category of race, detuned race or high-performance skis that typically shares similar construction, technology and under-boot widths ranging from 68-83mm. At Sun Peaks, the Ski Canada team turned the morning’s soft corduroys into eastern hardpack by the time they were done, but with the magazine’s strict rotation of testers executed with military precision, each ski was afforded the opportunity to be tested on tough blue and black terrain that progressively hardened up throughout the day. 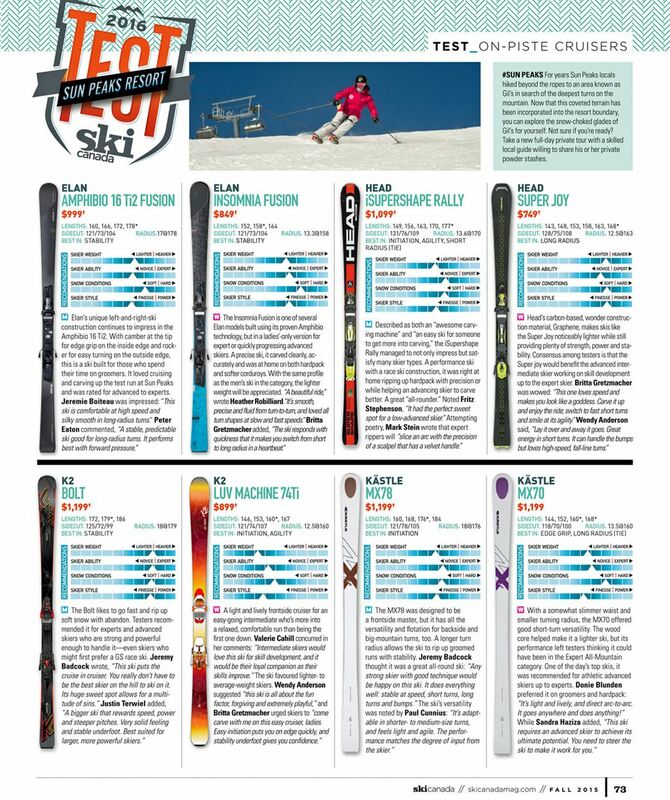 Distinctions between this category and last issue’s Expert All-Mountain category are many, but it boils down to On-Piste Cruisers being tested on a blue and black groomed run, while Expert All-Mountains skis are tested on varying snow conditions and terrain types, including bumps, trees and so on. But if no-speed-limit carving on groomers is your style, have a read of which skis you’d like to demo. MEN: The Redster Doubledeck 3.0 XT has been produced in race-carver tradition without it being a World Cup thoroughbred, which might knock some skiers off. Almost as much fun in slalom mode as GS, it shone at Sun Peaks in big turns, fast speeds, a stable platform and tenacious edge grip. 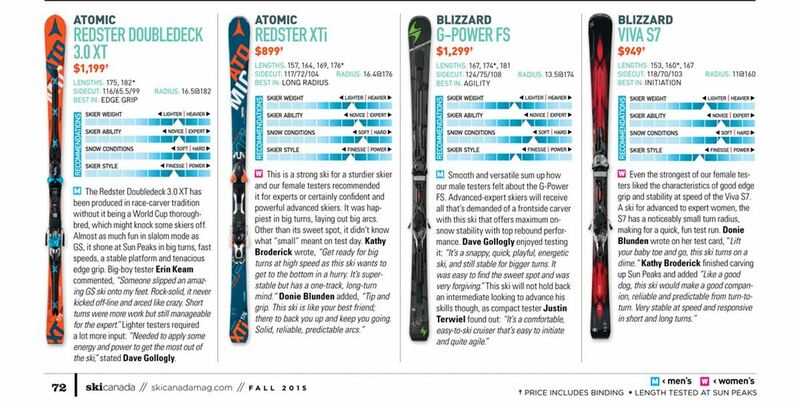 Big-boy tester Erin Keam commented, “Someone slipped an amazing GS ski onto my feet. Rock-solid, it never kicked off-line and arced like crazy. 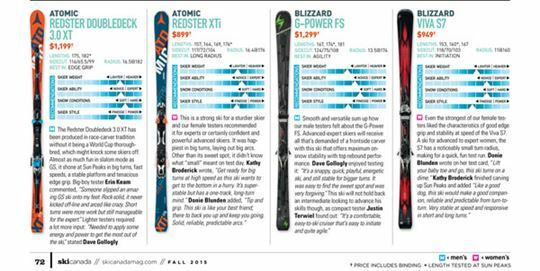 Short turns were more work but still manageable for the expert.” Lighter testers required a lot more input: “Needed to apply some energy and power to get the most out of the ski,” stated Dave Gollogly.